Brighten up your special day with some bold and bright numbers. Unique and modern Wedding Table Numbers are a simple way to mark your tables at your wedding reception, engagement, birthday party, club, coffee house, restaurant or home. Made of Natural Wood, this Table numbers can be paint in your favorite color for your special day, or leave it in it's natural look. Very EASY to USE , just put the number into the circle base and you good to go. Customer Satisfaction is our main goal. If you have any questions or concerns Contact Us any time. If you are not 100% satisfied MONEY BACK GUARANTEE! CLASSIC, SOPHISTICATED, ELEGANT. Wedding Table Numbers by Bestoffer are a beautiful centerpiece addition for weddings and special events! 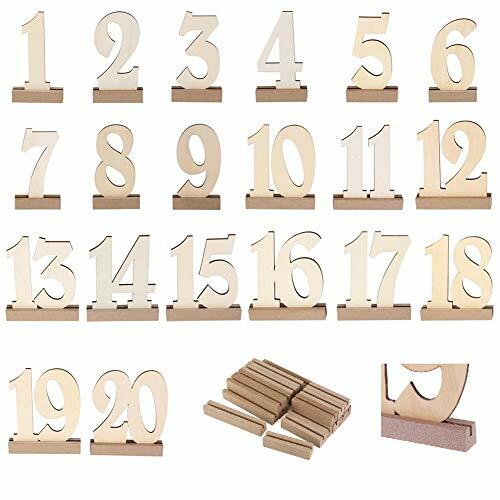 Include: Wooden Table numbers from 1 to 20. NATURAL. The durable laser cut table numbers are made from natural wood and measure approximately 6*5 inches. CUSTOMIZABLE. Enjoy the DIY yourself or with friends and family, full of fun! This Wedding table numbers are natural wood color but you could spray them any color you wish, stain, or glitter for a unique, personalized look. You may choose not to use the base and add them to a cake, flower arrangement, or centerpiece. EASY SET UP. Wooden Table Numbers have rectangular base and can be easily put on the guest tables. The numbers will fit into the base that can stay standing on their own. There is no need to glue to the bases. If you have any questions about this product by Bestoffer, contact us by completing and submitting the form below. If you are looking for a specif part number, please include it with your message.